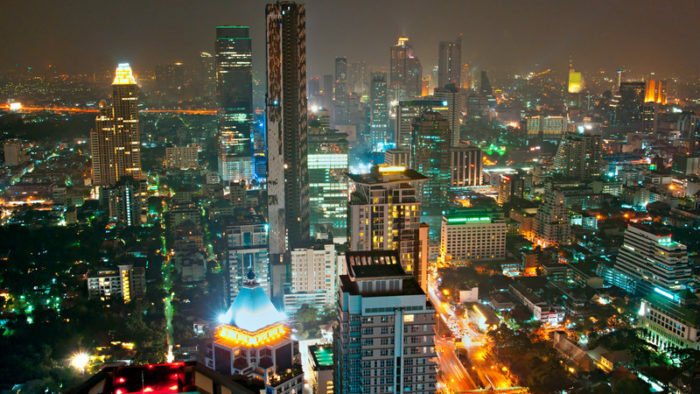 Thailand is one of the most visited countries in the world, hosting over 30 million tourists each year. That means there is one tourist for every two Thai people. Yet even with this influx, the country successfully retains a strong cultural identity and preserves stunning natural beauty. I first visited at the age of 18 and swam happily in the stream of backpackers who enjoy cheap beer and beach parties. Six years later I returned, nervously thinking that Thailand may have nothing more to offer. How very wrong I was. This country has so much going for it, anyone could have a great time here – whatever age, whatever background, whatever interests. Even though I was after something completely different second time round, I wasn’t disappointed. The food is unparalleled, the beaches too. But more than that, this is a country with a mix of the modern and the ancient. There are thriving, noisy cities and peaceful, pastoral farming villages. 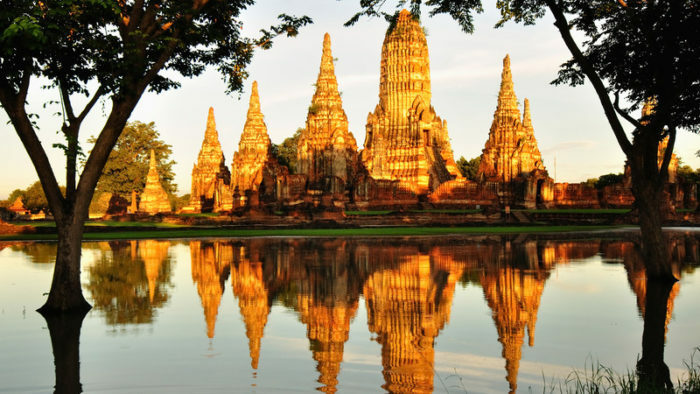 Thailand is steeped in history, culture and character. I ended up going back a third and a fourth time, and have every intention of returning again. Here’s why. 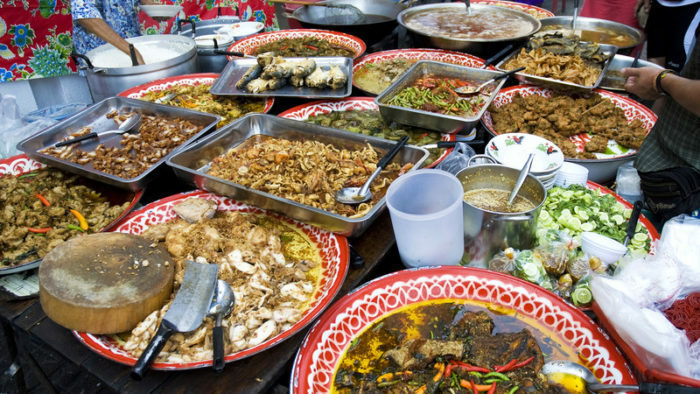 Thai cuisine has traveled far beyond its native shores and secured a place in hearts (and stomachs) around the world. But you haven’t tried Thai food until you’ve been to Thailand and eaten fried noodles from a street vendor, fresh from the wok and seasoned to taste by your own fair hand using the various chilies and chopped herbs perched on the side. You’ve probably sampled famous dishes like red and green curries, Pad Thai and spring rolls. But don’t be fooled into thinking you know all there is to know about Thai food. There are plenty more dishes to discover – have you heard of Tom Yum, Kuay Tiew? Tried a papaya salad? A Massaman curry? And I haven’t even mentioned the abundance of tropical fruit, the fresh coconuts. This place is truly food heaven! To really appreciate it, get hands on with a cooking class. You’ll see all the little touches and tricks that make Thai food so special (and get to eat it as you go!). The Thai people are renowned for their kind spirit and beaming faces – the country is known as “The Land of a Thousand Smiles” after all. This positive nature shines through in their hospitality. Nowhere else in the world have I been met with such doting service. You are truly made to feel like royalty, right down to the details. The food is not only delicious, but well-presented, with vegetables often carved intricately into the shape of flowers. The bed is not just made, but decorated with oriental throws and towels folded into the shape of elephants. You might even find yourself bowing to people back home with your hands pressed together in a prayer position as you pick up this trademark Thai gesture. 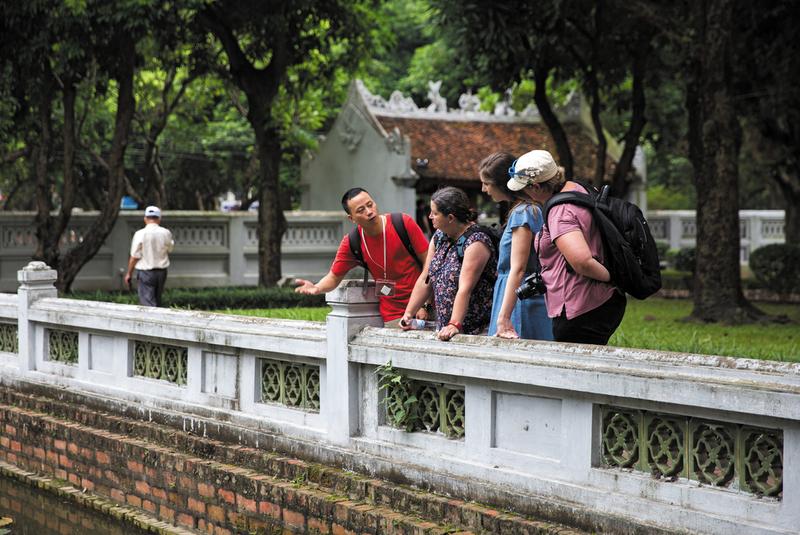 It is pretty impressive that with millions of visitors and thousands of expats, Thailand’s heritage remains fairly undiluted. It makes sense when you consider their history – this is the only country in Southeast Asia never to be colonized, and Thailand actually means “land of the free”. So, what is Thai culture? There are a number of factors, but religion plays a big part. Over 90% of Thai people are Buddhist, and you’ll find temples and Buddhist imagery here there and everywhere. Some of my favorite Wats (temples) include Wat Doi Suthep in Chiang Mai and the sleeping Buddha in Bangkok. You may visit so many that you’ll be all “templed out” at some point. But don’t worry, when that happens there’s still plenty more to do. Thailand’s largest industry is agriculture, and open plan markets with fresh produce are much more common than Western-style supermarkets. You can visit a floating market in Bangkok, or wander through a bustling night market in Chiang Mai to see for yourself all of the colors on show. Another distinctive aspect of Thai culture is the respect they have for their monarchy. Thai people truly revere their King. You will see his image everywhere, from billboards to the walls of hotels, restaurants and houses. 2017 saw a year of mourning after the passing of King Bhumibol Adulyadej, and I saw many Thai people wearing black, deeply affected by the loss. In Thailand you can be imprisoned for speaking in a derogatory way about the King, and if you ever make it to the cinema you’ll stand before the show starts to sing the national anthem. These displays of reverence are characteristic of Thai people, who are some of the most respectful people I’ve met. What do Venice and Bangkok have in common? Nothing, you might think. Well actually, Bangkok once had dozens of canals lined with buildings raised on stilts and was nicknamed the “Venice of the East.” And that’s not the only surprise this city has for you. One surprise might be the heat – yes, it can be very hot – but there is so much to do and discover. Shopaholics will be thrilled with the huge markets and shopping malls. If that’s not your cup of tea then experience the nightlife with a beer by the river, the floating markets, or jump in a tuk tuk and see where it takes you. This city never sleeps, and with an easily navigable and cheap metro, exploring is that much easier. 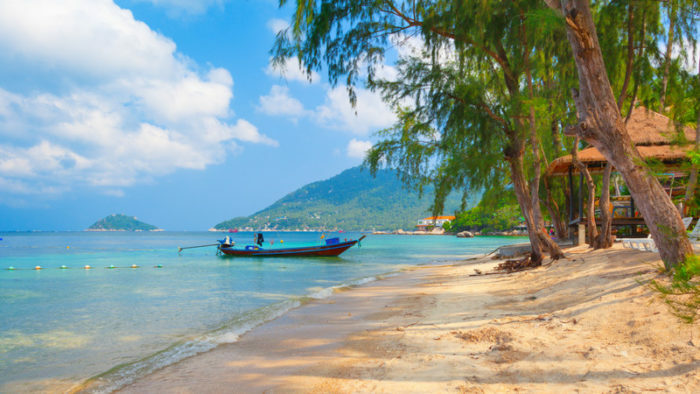 The classic image of white-sand beaches, turquoise seas and wooden sailing boats is commonly associated with Thailand. And rightly so. With over 3,000 kilometers of coastline and more than 1400 islands, there is no shortage of options when it comes to beach time. It is hard to beat the relaxing sound of waves lapping against the shore as you sip on sunset cocktails and watch the sky slowly change color. And it’s not only the sand, sea and sky that are impressive, the limestone cliffs make for a gorgeous backdrop to those snorkeling trips and sunset snaps. Thailand is the fifth largest rice exporter in the world, and as you cruise through the countryside you’ll see picturesque scenes of rice paddy fields stretching as far as the eye can see. (You can even visit an organic farm in Sukhothai on Peregrine’s Thailand and Laos trip!) To compliment the flat paddy pastures, there is plenty of lush green jungle in the mountainous North to be trekked through, waterfalls to be uncovered, and hill tribes to visit. The country’s second largest city, Chiang Mai, makes a perfect base from which to explore the lush green north, and is a delight in itself. Thailand has everything you could want. An abundance of delicious food, smiling hospitality, a resilient and unique culture and history. And all this set to the backdrop of a lively capital city, serene green paddy fields, mountainous jungle, and pristine beaches. I assure you that once you’ve been, you’ll be dreaming of the next time you can get back there, just as I am now. Ready to experience this remarkable country? Check out Peregrine’s range of tours in Thailand. I've dragged my backpack across six continents, but for now it rests in the bottom of my wardrobe in Melbourne. I have a healthy obsession with bookshops, hammocks and coffee, and when not plotting the next adventure, teach English abroad. Don't ever make me choose between mountains and beaches.